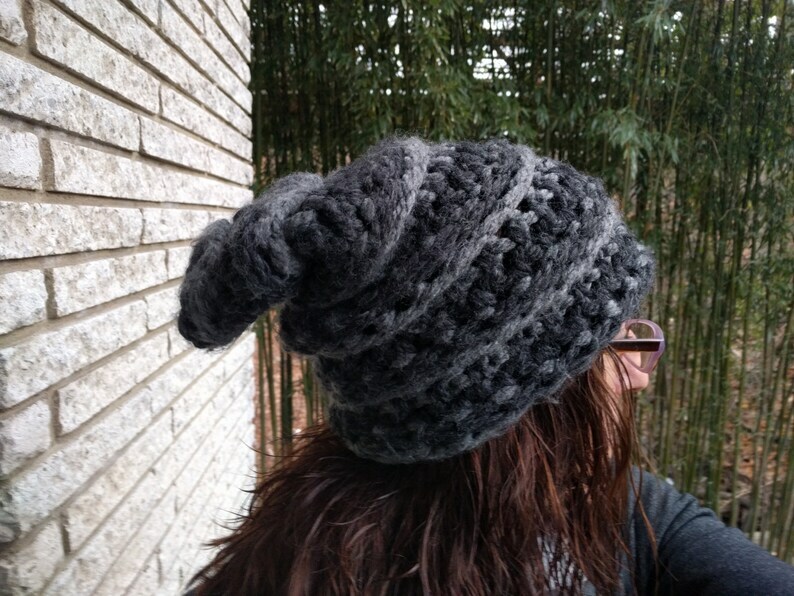 This thick gray adult size crochet slouch hat for men & women has spaces between the stitches so it is breathable while keeping you warm. Handmade with love in a 100% smoke-free pet-free home. Custom Order requests are accepted by shops that have a blue 'Custom Order' button enabled on their shop page, which I do not. With few exceptions, Custom Orders are generally not accepted. The fun I have these days is primarily in pattern design itself. There are many talented crocheters here on Etsy who would be interested in producing your Custom Order physical item for you--even from my pattern designs that you've purchased that you can send to them. If it is a particularly different/interesting/unique Custom Order idea that I have not done before & that is NOT yet done well by others (for example the great mermaid tail blankets), I'll occasionally consider it. When in doubt, feel free to ask!